Alright, can I tell you a secret? This post really isn't mine. The idea was. The execution, not so much. The credit for this makeover goes to my hubby. Now don't get me wrong, I love a good project. I'm not intimidated by power tools, or even things that I haven't tried before. Yet for some reason this project just really overwhelmed me. That's when hubby really took the lead and made it happen. See we weren't planning on making over our fireplace this soon. 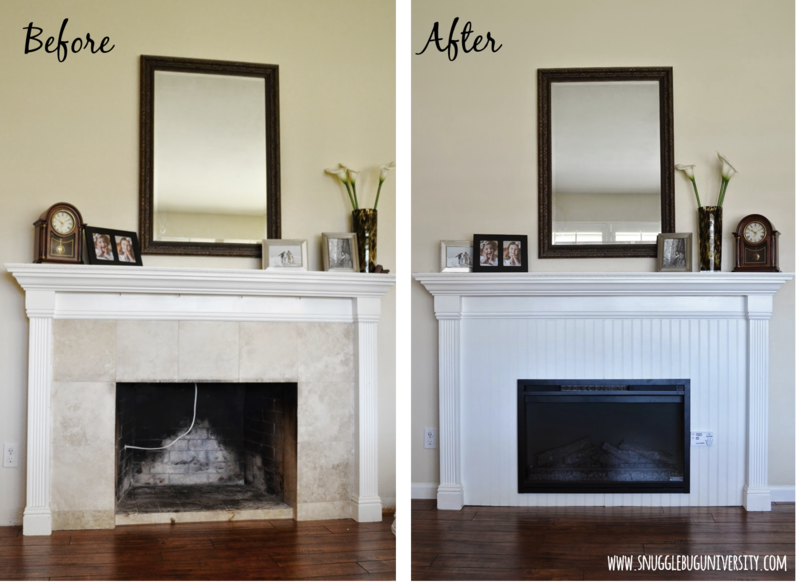 When we added on to our house, we knew we'd have to close off the wood burning fireplace. We figured we'd eventually put in an electrical insert, which we knew might also mean redo'ing the fireplace surround to make it work.We thought we'd be able to just leave the fireplace alone until that time came. Boy were we wrong! We totally didn't think it all the way through! We had a LIVE wire in our fireplace. The fireplace used to have (ugly) glass doors which covered the fireplace, but after we redid our flooring it did didn't fit anymore. So it was just open...with a LIVE wire...in a house with two little people. This stressed me out. Yet I really didn't want to take on a project that might be more expensive or time consuming than we'd really hoped for. 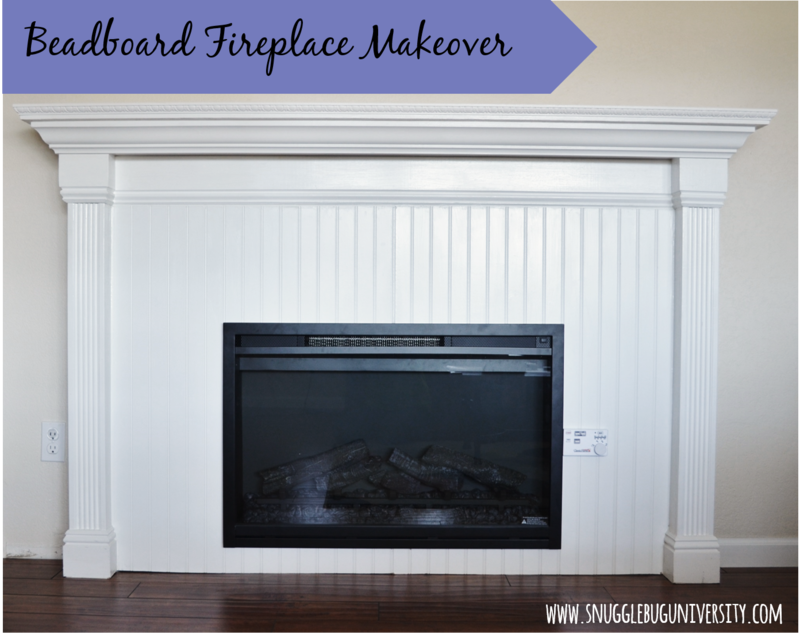 I came up with the idea of adding a bead board surround because 1) bead board is cheap 2) we didn't need to destroy the current surround (which seems to have a complicated history...and will require a bit of work to handle). . The insert was a VERY tight squeeze, so hubby removed some of the inner tile. Then he build a base out of plywood to hold the fireplace level. Then we added the bead board. It's two pieces, which I cut with a jigsaw to make it fit into our existing space. This took a really long time! Lots of little adjustments. Hubby used an adhesive to attach the bead board right on top of the tile. Then we caulked around the edges, where the bead board met the molding. We wired insert and screwed the insert into the walls of the fireplace to secure it. The nice thing about this electric insert is that it doesn't get hot, so we don't need to worry about the beadboard being in contact with heat. I'm really happy with it. The whole thing came together for less than $30 (not including the price of the insert), which seems like such a great deal! What do you think? And finally, do you follow my blog already? Yes, awesome!!! If not, please consider following this blog! I'm really trying to build my followers via email and on facebook, pinterest, twitter, and instagram.